The NIU Board of Trustees on Thursday, Oct. 21, approved the sale of Build America Bonds to provide $112 million to fund improvement projects across campus. Revenue from the bond sale will help the university improve parking for commuter students, create a state-of-the-art intramural athletic complex, modernize residence halls and pay to repair and remodel one of the students’ favorite buildings, the Holmes Student Center. All of the projects funded by the bond sale are essential to meeting NIU’s goal of becoming the most student-centered research university in the Midwest by 2020. The Build America Bonds are the key to making the projects possible. Created as part of the American Recovery and Reinvestment Act, Build America Bonds are a type of municipal bond that carries special tax credits and federal subsidies for either the bond issuer or the bondholder. They reduce the cost of borrowing for state and local government issuers and governmental agencies by subsidizing 35 percent of the cost of interest. The university calculates that the bonds will allow NIU to save nearly $36 million in principle and interest over the life of the 30-year bonds. To take advantage of those savings, the university must issue bonds before the program expires Dec. 31, 2010. “This was an opportunity not to be missed, and we are delighted that the NIU Board of Trustees moved quickly to approve this plan,” Peters said. Intramural Sports Complex. A new, lighted intramural sports complex could double, or even triple the number of students (currently 5,600) participating in outdoor intramural sports, the university estimates, based on student surveys. The new complex will be located northeast of the Convocation Center. 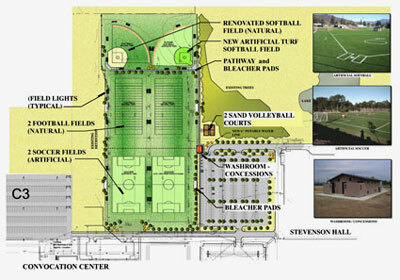 Potential facilities include two softball/baseball fields, two football/rugby fields and two soccer/lacrosse fields, some of which might have artificial turf. The complex also might include tournament-quality sand volleyball courts, bathrooms, a concession stand, spectator seating, scoreboards and equipment storage. Repair and Remodeling of Grant Towers C and D. Nearly 25 percent of the students who have enrolled at NIU since 1970 have lived in Grant Towers, and the buildings have hosted thousands of summer campers from throughout northern Illinois. Despite such heavy use, the building has never undergone significant upgrades or repairs. This project will decrease the capacity of each tower to 340 students (down from 500) and increase the size of each room by about 30 percent. The community lavatories will be refitted with new fixtures and will be reconfigured to provide more privacy. All mechanical, HVAC and electrical systems will be upgraded, and roofs will be replaced. The project will also include a total overhaul of the common area connecting towers, including the creation of a modern food-court-style dining area. Parking and Road Improvements, Bike Paths. At least eight parking lots on campus will be expanded, repaired or replaced to enhance parking, especially for commuter students. The main roadway on West Campus, as well as a portion of Kishwaukee Drive on the eastern edge of campus, will be replaced with a heavy-duty roadbed to better withstand the constant pounding from Huskie Bus traffic. Also included in the plan are long-contemplated bike paths and bike parking lots to encourage travel by bicycle instead of car. Holmes Student Center. Opened in 1962, the Holmes Student Center has been a hub of campus activity for nearly 50 years. Today the building’s infrastructure, mechanical systems and HVAC systems are long past their useful lifespan. Its roofs leak, there is poor accessibility for individuals with physical disabilities and most of the interior spaces have not been updated since the building opened. 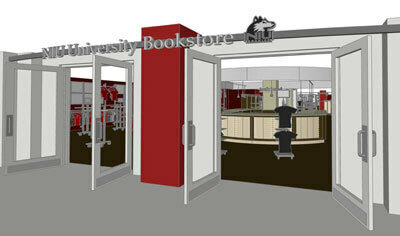 Funding from the bond sale will be used to address most, if not all, of those issues as well as to significantly remodel the University Bookstore. Stevenson Towers Fire Sprinkler System. This work will bring the building into compliance with a law passed by the State of Illinois in 2004, which requires all college residence halls in the state to have sprinkler systems for fire suppression. Additional proceeds from the bond sale will be set aside for infrastructure improvements. Planning work on these projects will begin almost immediately, and most of the work will be completed by 2015. As with major campus improvement programs in the past, the Build America Bonds will be paid for through a graduated increase in the student revenue bond fee. Students living in residence halls also will pay a modest surcharge to support these bonds. The charges, which will begin appearing on student bills in Fiscal Year 2012, will be phased in over a four-year period. In FY2012, students carrying 12 credit hours or more will pay $2.50 per credit hour. That fee will increase to $3.50 per credit hour in 2013; $4.75 per credit hour in 2014; and $6 per credit hour in 2015. These are “not to exceed” rates. Depending on the final pricing of the bonds, the actual rates could be even lower. Since a significant portion of the renovation and refurbishing is occurring throughout the residence halls as a result of this bond issue, students living in the residence halls will be charged a $25 per semester surcharge in FY12; $30 per semester in FY13; $40 per semester in FY14; and $50 per semester in FY15.